Five Famous Actors Who Play Guitar! Written by: Mickey Richardson on June 3, 2011. Doesn’t matter whether you remember him as Marty McFly, Alex P. Keaton or that punk kid brother in the movie Midnight Madness, Michael J. Fox can burn it up on the 6-string. Check out Back to the Future, the movie is a classic. Pay attention to the scene where Marty performs Johnny B. Goode. Michael J. Fox’s chording and shredding during the school dance scene looks pretty good… most excellent dude! I particularly enjoyed his ability to mimic a few legendary guitar moves! Check him out kicking over his amp cabinet much like Pete Townsend of the rock group The Who, playing guitar while lying on his back… why isn’t that Angus Young of AC/DC, and let’s not forget how he chicken walked across the stage like the trademark Chuck Berry move. All and all, Michael J. Fox really plays the part well. Watch the film for yourself and see how it all comes together when Marty shows the high school kids at the “Enchantment Under the Sea Dance,” his interpretation of futuristic guitar stylings with his McFly shred which just happens to combine the styles of Jimi Hendrix and Eddie Van Halen. Adam Sandler is a an American actor and comedian who aside from his overall fame is well know for playing guitar and singing funny songs in his films and various comedy records. I can first remember seeing Sandler on MTV’s “Remote Control,” where you may remember him from such characters as “Stud Boy,” and the “Trivia Delinquent.” Around this same time I can remember catching Adam Sandler’s stand-up on Comedy Central and was pleasantly surprised to find him playing guitar during some of his funniest comedy routines. Sandler has scored big with audiences through funny songs, stand-up comedy, classic TV characters and blockbuster films. Throughout his career, the guitar has been at his side for the ride. Although his early career involved him portraying that explorer kid in the Activision video game commercial for Pit Fall (man I loved that game when I was a kid!) Jack Black is not only a famous actor but also a guitar rock god as the lead singer and guitar playing front man of the rock band… Tenacious D! JB and Kyle Gass know how to shred the tasty grooves and this all culminated together nicely into a guitar player cult classic in the film Tenacious D and the Pick of Destiny. The film is based on the classic good versus evil motif where Satan himself is portrayed by Dave Grohl of the Foo Fighters. Check out the clip below from Pick of Destiny of a song entitled “Master Exploder,” and you might never be the same! Fans of the original British TV show “The Office,” and “Extras,” can tell you that the genius behind these series was Ricky Gervais. Ricky is a comedian, hit television show producer and movie star. Aside from his various comedy exploits, Ricky is also the famous guitarist from the 80s UK pop sensation, Seona Dancing! 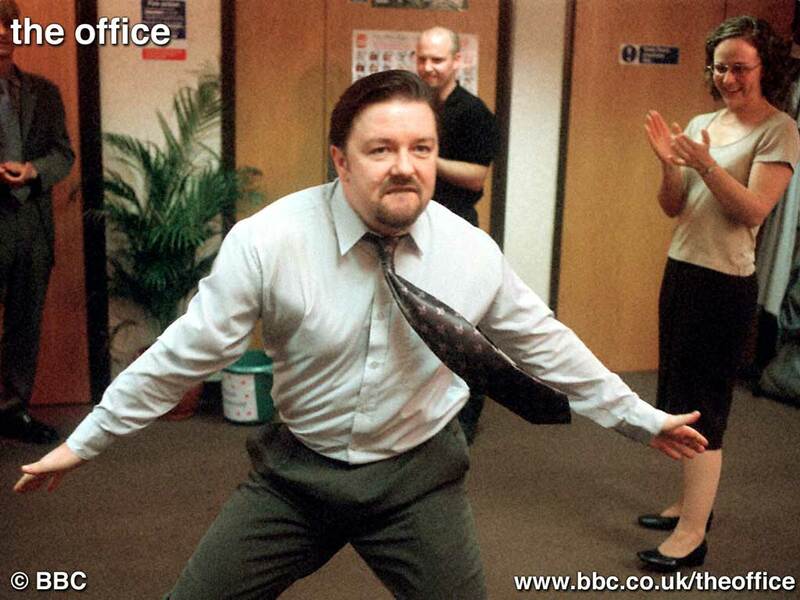 Have a look at the video below from The Office (UK version) where Ricky’s character David Brent riff’s on one of his original hit songs. It kinda feels weird like I’m playing a game when stating his name, but did you know that Kevin Bacon (yes, THE Kevin Bacon) is also a famous guitarist? Kevin Bacon is an American actor and star of dozens of blockbuster hit films including Animal House, Flat Liners, A Few Good Men and Apollo 13. But that’s not all, he’s also a song writer, singer and guitarist with his brother Michael in the musical duo Beacon Bros! Check out the video below of the Bacon Bros. in action with guitar and song!